When my youngest was little, he told his brother he was more Irish than his brother because HE and only HE was born on St.. Patrick's day. I was thinking about that today as I was preparing this blog post because he teased me about this today. So here are some of our favorite green flower girl dresses to get you thinking! Oh and the favorite Irish movies to follow! 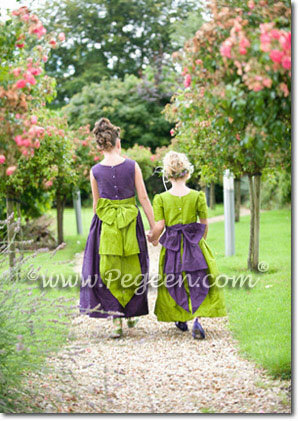 #1 Starting with a wedding in Ireland, these green and deep plum silk flower girl dresses were made in our style 345 with a Cinderella bow. We thought it nice that they chose to have the dresses made in opposite combinations, making them quite interesting. #3 Some times, the simplest dress works great! Grass green flower girl dress in silk with a square neck. #4 We loved this bride's pale green dress - thought it absolutely a winner for a St Patricks celebration. Paired with our apple green silk flower girl dress. #5 This beach side wedding had great touches of orange for this wedding. 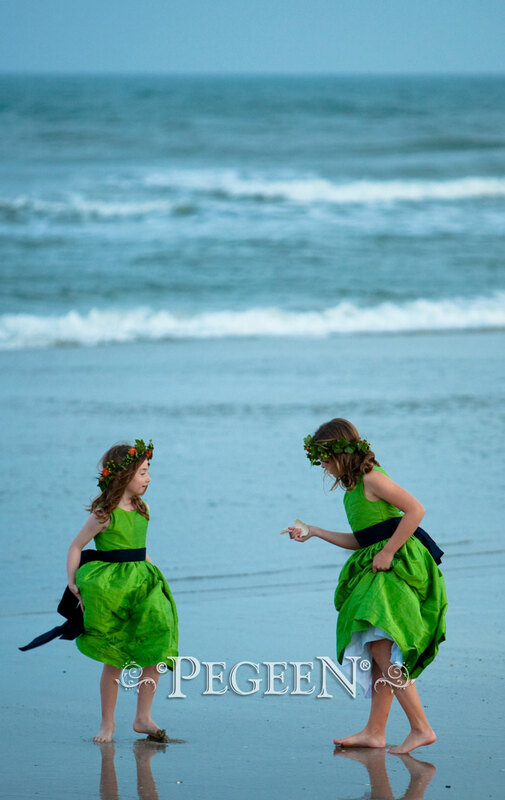 Keylime green custom silk flower girl dresses with navy Cinderella bow. #6 The contrast of color against the ocean was spectacular. 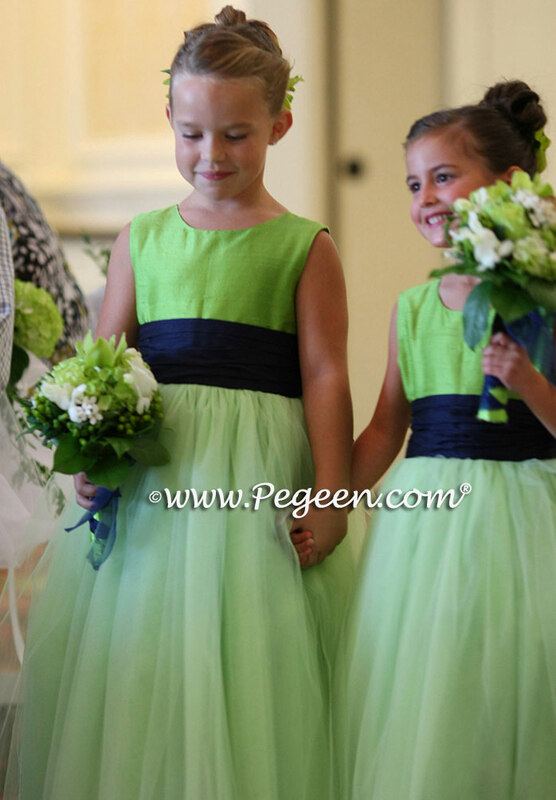 Keylime green custom silk flower girl dresses with navy Cinderella bow pegeen Style 345. #7 Emerald green with touches of lime green in the flowers are a pretty combination for St. Patrick's weddings. 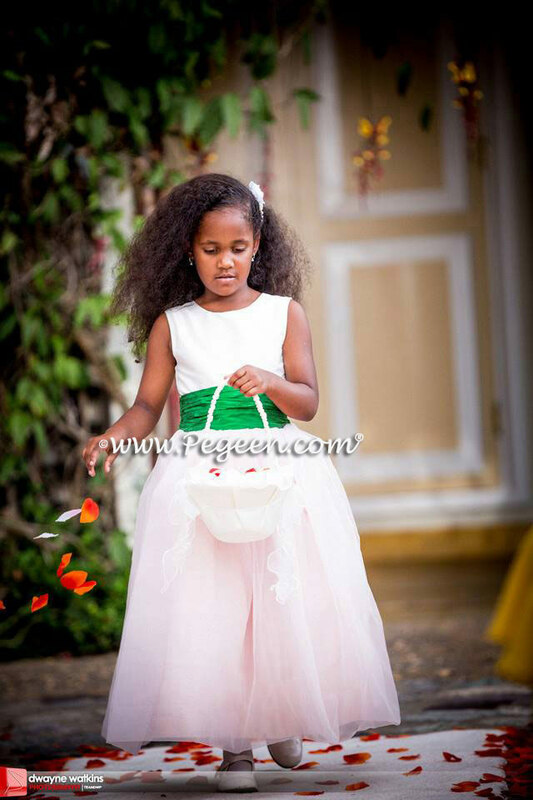 Emerald green custom silk flower girl dresses with organza overskirt Pegeen Style 301. #8 Emerald green and hot pink accents for this little flower girl. Our bride was just as bold with her bridesmaids too. Emerald green and Boing pink custom silk flower girl dresses with organza overskirt Pegeen Style 383. #9 This bride had great imagination to carry the theme of green and navy in her wedding, right down to her aisle runner. 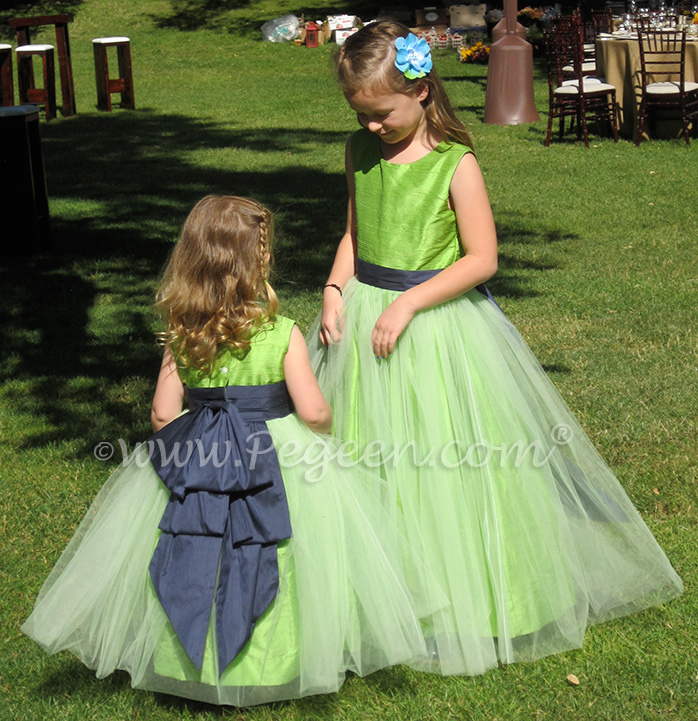 Apple green and navy silk and tulle custom silk flower girl dresses Pegeen Style 402. #10 What can we say? 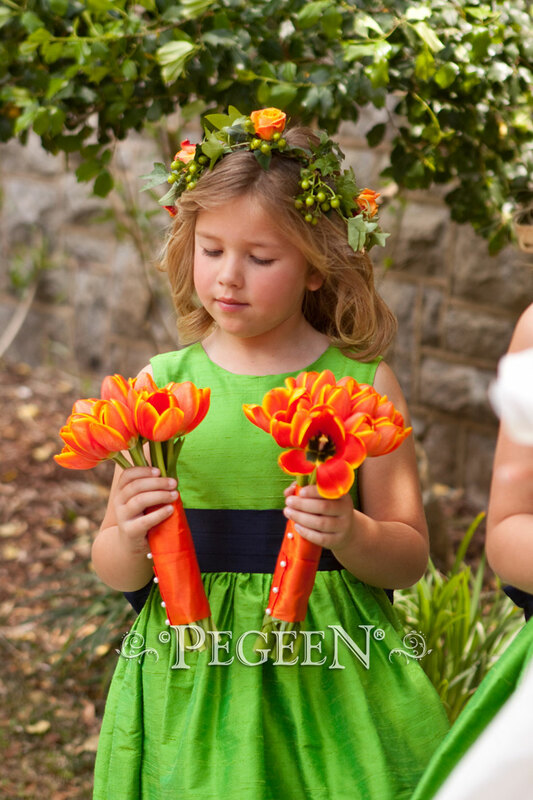 These little redheads were perfect in their green dresses trimmed with real flowers. 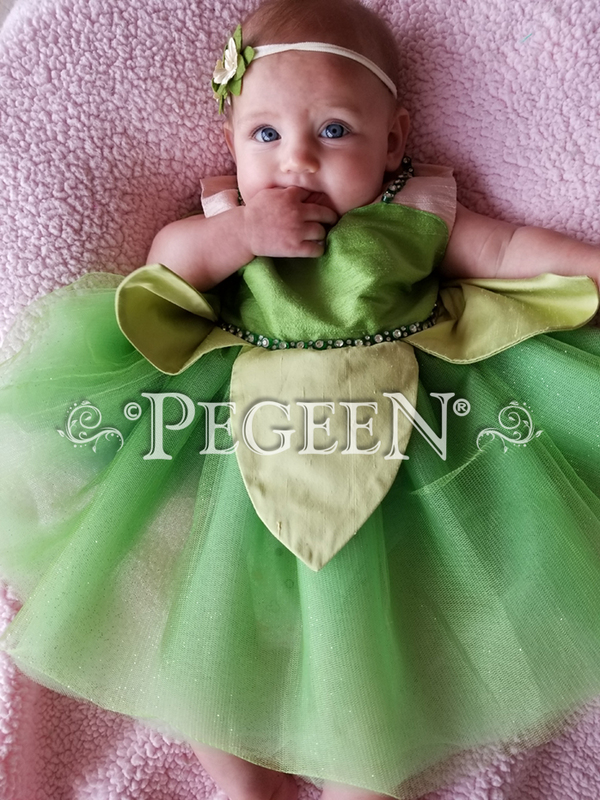 Kelly green and thistle silk custom silk flower girl dresses Pegeen Style 383. 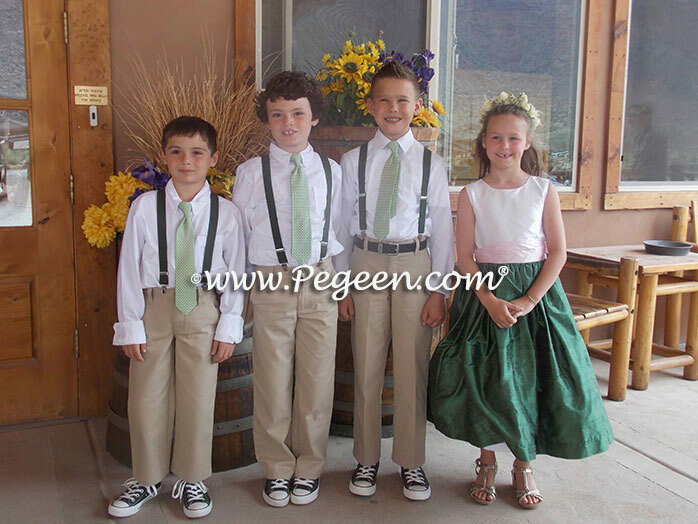 #11 The boys trimmed in their light green ties, basil suspenders with their sister in basil green was really cute. Basil green and peony pink silk custom silk flower girl dresses Pegeen Style 383. Boy's suspender sets. #12 Who COULD resist that cake? 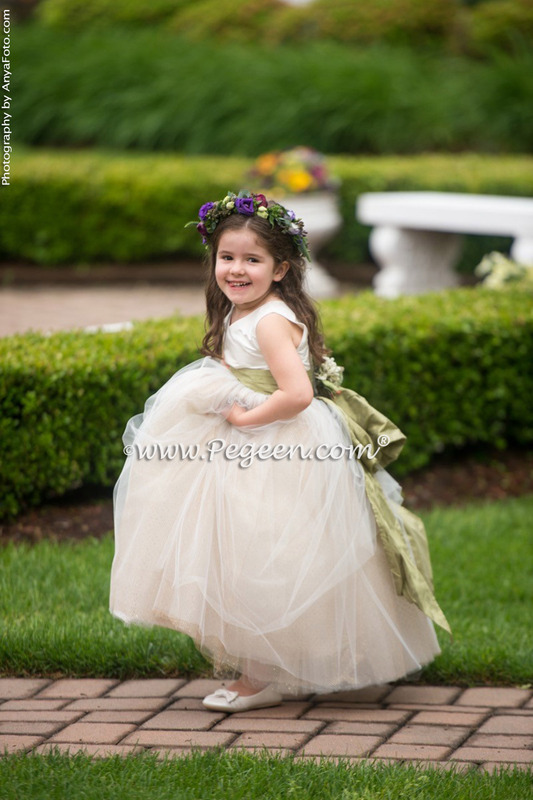 Sage green and ivory custom silk flower girl dresses Pegeen Style 394. #13 The lovely setting of the Canadian Mountains. 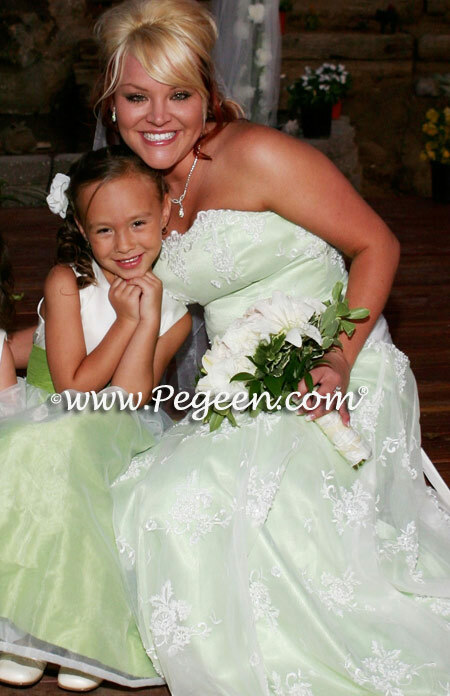 Sprite green and ivory custom silk flower girl dresses Pegeen Style 398. #14 This green wedding featured hydrangeas and citrus orchids. 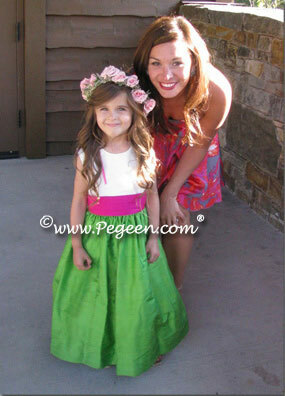 Clover green and bisque flower girl dresses Pegeen Style 398. #15 What could be better than Tinkerbell at your wedding? 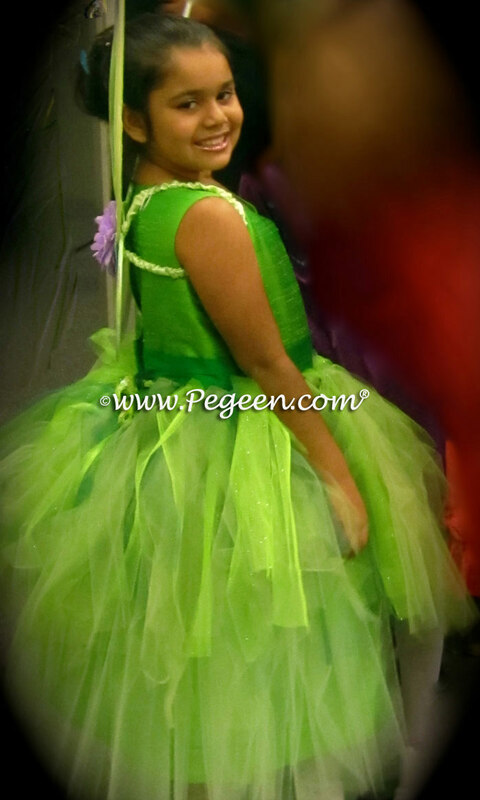 Multi shades of green tulle and grass green Tinkerbell flower girl dresses Pegeen Style 901. #16 We never did get a photograph on the child but that doesn't make this dress any less special. Shamrock green and ivory puddle flower girl dress with Cinderella Bow Pegeen Style 403. #17 We thought these purple and green flower girl dresses so special they were made as one of our Flower Girl Dress of the Year honorees. 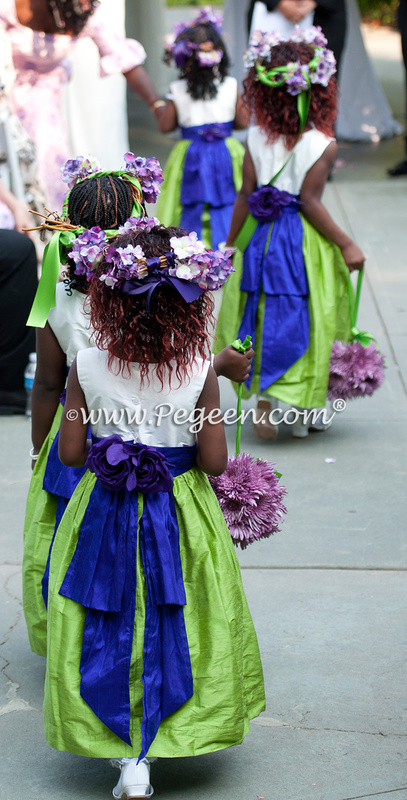 Key Lime and Royal Purple custom silk flower girl dresses Pegeen Style 383. #18 For her older junior bridesmaid, she accented in the opposite colors. 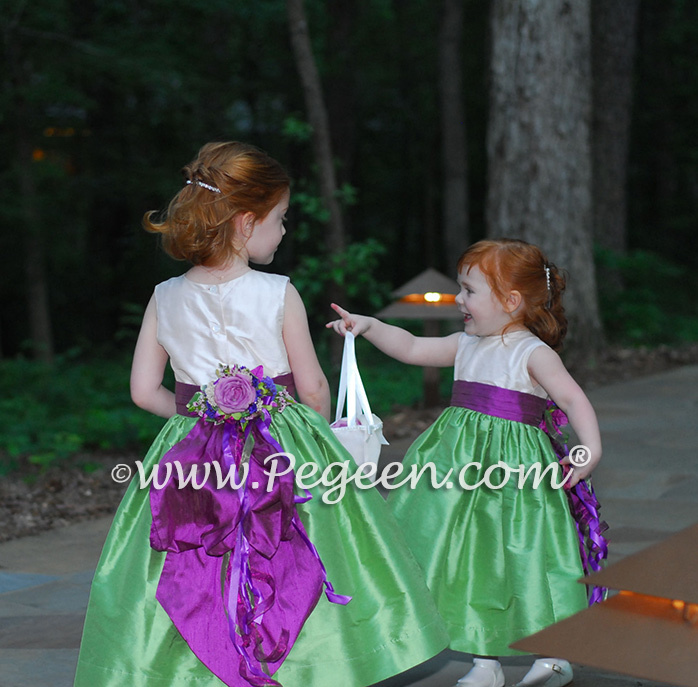 Key Lime and Royal Purple custom silk flower girl dresses Pegeen Style 383. #19 And still, another Tinkerbell. 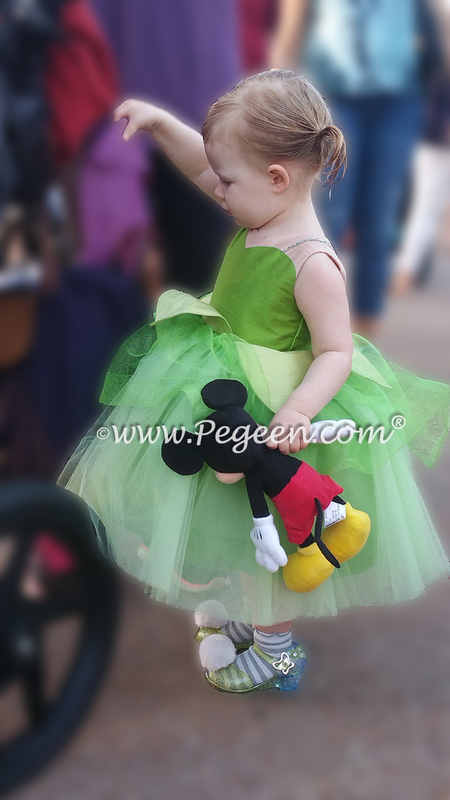 Multi shades of green tulle and grass green Tinkerbell flower girl dresses Pegeen Style 901. #20 This harvest green and ivory flower girl dress was accented with a layer of gold lame and metallic gold tulle. 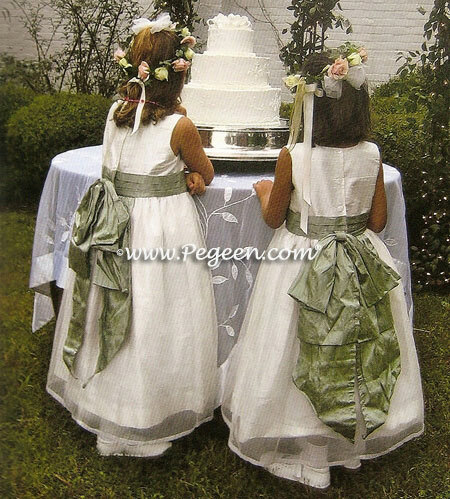 Harvest green custom silk flower girl dresses Pegeen Style 402. #21 This spruce green sash is contrasted against these antique while silk flower girl dresses. 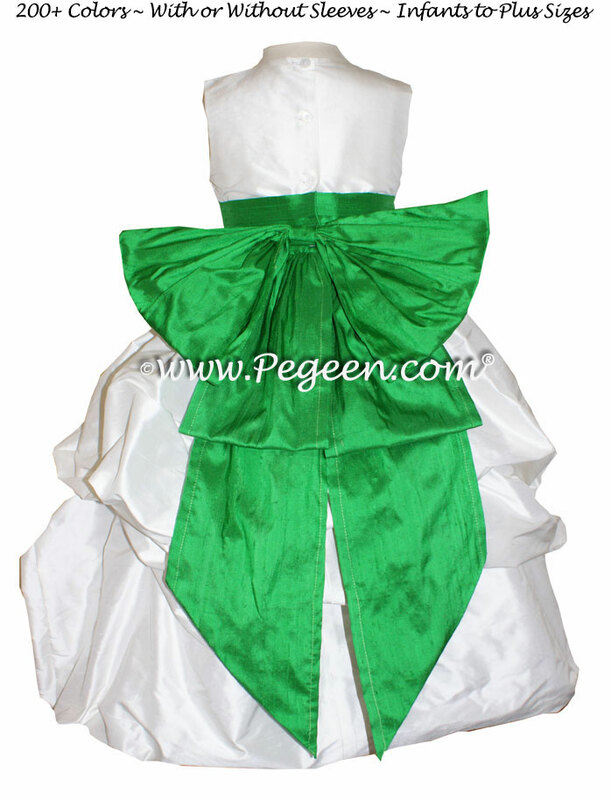 Spruce green custom silk flower girl dresses Pegeen Style 398. #22 The perfect mint green when you are thinking of an Irish wedding. 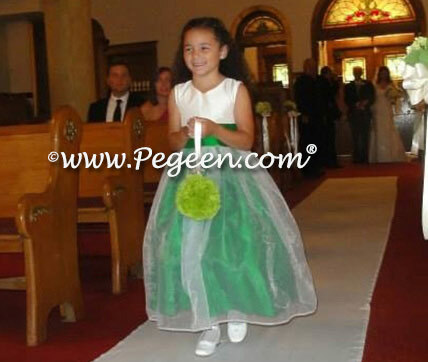 Summer green custom silk flower girl dresses Pegeen Style 345. #23 Pink and green still are our favorite combination. 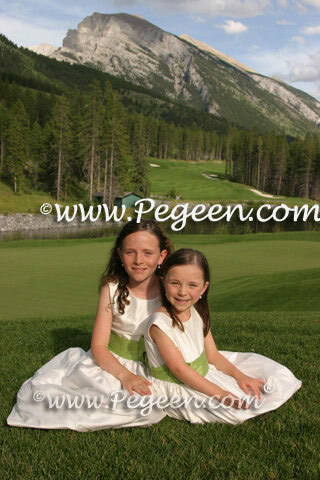 Spring green and peony pink custom silk flower girl dresses Pegeen Style 802. #24 Another version of style 802. 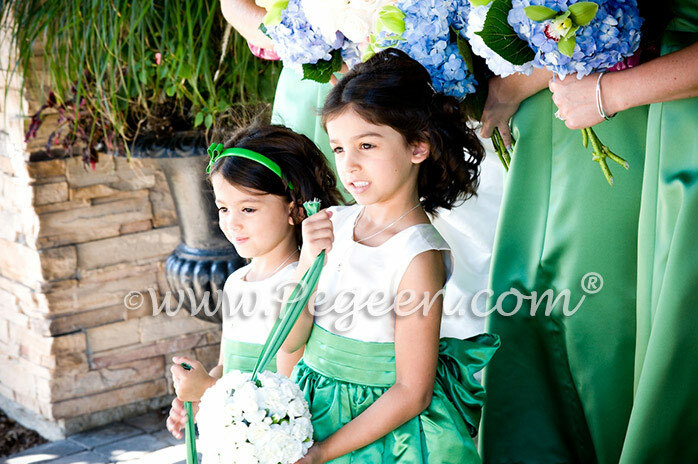 Emerald green and peony pink custom silk flower girl dresses Pegeen Style 802. #25 And finally, this citrus green and navy jr bridesmaids dress is a terrific color for green weddings. 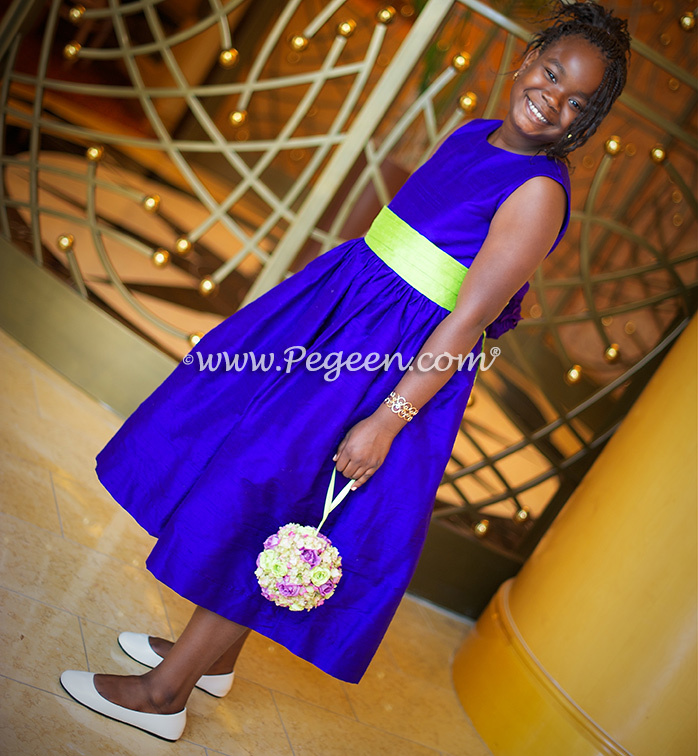 Citrus green and navy custom silk flower girl dresses Pegeen Style 320.